I had Ubuntu 14.04 LTS installed on my Laptop. After a while I had some troubles starting it up. I decided to reinstall Ubuntu. I had 3 ntfs partitions, 2 ext3 partitions the mount point for the first was / and for the second was ./local and a swap partition. During the reinstallation I chose the option: "erase Ubuntu 14.04 and reinstall". The first thing to do is to take a forensic copy of the drive. Duplicating the drive entirely gives you the flexibility to work on repairing the problem on the copy while insuring you do no further damage to the original. I like dc3dd for this better than dd as dc3dd provides a progress report while it runs. 3) determine what your source (old) drive is named This is likely /dev/sda but to be sure look with Disks from the GUI in the attached image below you can see my sda1 is a 128GB drive with 2 64GB partitions. Now that we have a plan we will duplicate the source to the target using dc3dd. dc3dd if=/dev/sdX of=/dev/sdY change X to match the source (likely a) and Y to match the target (likely b or c) check your notes and be sure you have this right!!! While we are copying the source drive to the target to insure we can always go back in case something goes wrong and we will be no worse off than before, we should likely familiarize ourselves with partitions in general. A good write up can be found at http://www.tomshardware.com/forum/270354-32-understnading-extended-logical-primary-partitions This knowledge will be useful later in the process. 6) When the copy is complete shut down, disconnect the drive marked source (old drive) and put it away somewhere safe. 7) Boot up the machine again with the Live DVD/USB with the target (new drive) attached. 8)We're going to install testdisk to recover the partitions on the target drive which is now identical to the source in terms of data. TestDisk must be executed with Administrator privileges. To navigate in TestDisk, use the Arrow and PageUp/PageDown keys. To proceed, confirm your choice(s) with the Enter key. To return to a previous display or quit TestDisk, use the q (Quit) key. To actually write partition data to the MBR, you must choose the "Write" selection and press the Enter key. Choose Create to instruct Testdisk to create a log file containing technical information and messages, unless you have a reason to append data to the log or you execute TestDisk from read only media and must create the log elsewhere. Choose None if you do not want messages and details of the process to be written into a log file (useful if for example Testdisk was started from a read-only location). Use up/down arrow keys to select your hard drive with the lost partition/s. Select the partition table type - usually the default value is the correct one as TestDisk auto-detects the partition table type. TestDisk displays the menus (also see TestDisk Menu Items). Use the default menu "Analyse" to check your current partition structure and search for lost partitions. Confirm at Analyse with Enter to proceed. Now, your current partition structure is listed. Examine your current partition structure for missing partitions and errors. The first partition is listed twice which points to a corrupted partition or an invalid partition table entry. Invalid NTFS boot points to a faulty NTFS boot sector, so it's a corrupted filesystem. Only one logical partition (label Partition 2) is available in the extended partition. One logical partition is missing. Confirm at Quick Search to proceed. Quick Search for partitions TestDisk displays the first results in real time. During the Quick Search, TestDisk has found two partitions including the missing logical partition labeled Partition 3. Highlight this partition and press p to list your files (to go back to the previous display, press q to Quit, Files listed in red are deleted entries). All directories and data are correctly listed. Save the partition table or search for more partitions? menu search! When all partitions are available and data correctly listed, you should go to the menu Write to save the partition structure. The menu Extd Part gives you the opportunity to decide if the extended partition will use all available disk space or only the required (minimal) space. Since a partition, the first one, is still missing, highlight the menu Deeper Search (if not done automatically already) and press Enter to proceed. After the Deeper Search, the results are displayed as follows: The first partition "Partition 1" was found by using backup boot sector. In the last line of your display, you can read the message "NTFS found using backup sector!" and the size of your partition. The "partition 2" is displayed twice with different size. Partitions listed as D(eleted) will not be recovered if you let them listed as deleted. Both partitions are listed with status D for deleted, because they overlap each other. 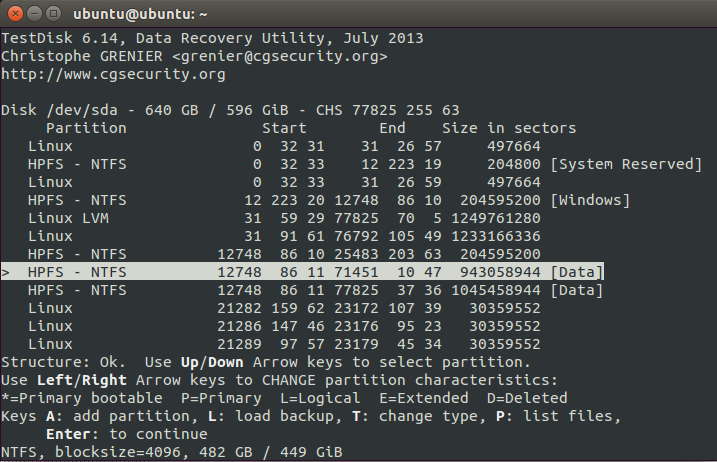 You need to identify which partition to recover. Highlight the first partition Partition 2 and press p to list its data. damaged file system (click on thumb). Let this partition Partition 2 with a damaged file system marked as D(deleted). Press p to list its files. It works, your files are listed, you have found the correct partition! Hint: read How to recognize primary and logical partitions? Note: If a partition is listed *(bootable) but if you don't boot from this partition, you can change it to Primary partition. It's now possible to write the new partition structure. Note: The extended partition is automatically set. TestDisk recognizes this using the different partition structure. The boot sector of the first partition named Partition 1 is still damaged. It's time to fix it. The status of the NTFS boot sector is bad and the backup boot sector is valid. Boot sectors are not identical. To copy the backup of the boot sector over the boot sector, select Backup BS, validate with Enter, use y to confirm and next OK. The boot sector and its backup are now both OK and identical: the NTFS boot sector has been successfully recovered. Not the answer you're looking for? Browse other questions tagged partitioning data-recovery or ask your own question. Lost partitions after accidently selecting “Erase entire disk” on Ubuntu install (but did not proceed with installation)? How to recover deleted “dpkg” directory? accidentally deleted windows while installing ubuntu, not able to get it back please help! How to remount logical volumes again after using lvremove?